First, my standard quick disclaimer: I’m not a lawyer and the information in this newsletter isn’t legal advice. Rather, it contains a selection of information from various sources. If you need legal counsel, please consult an attorney. The GDPR (https://www.eugdpr.org/) becomes enforceable from May 25, 2018. It gives EU citizens control of their digital data by empowering them with the right to know when personal data is being collected, what data is being collected, access to that data, and to purge it on request. the legislation affects not only businesses and organizations operating in Europe, but also those ‘processing the personal data’ of people living in the European Union. Which includes most websites around the world. Part II: Click here to read Part II in this seriesTuesday, May 15th. The WordPress team is scheduled to release WordPress version 4.9.6 Tuesday, May 15th. First, a quick disclaimer of my own: I’m not a lawyer and the information in this newsletter isn’t legal advice. Rather, it contains a selection of information from various sources. If you need legal counsel, please consult an attorney. This is Part II in this series and addresses the new GDPR and Privacy tools that WordPress is developing. Quite a few of you have reached out to me after reading Part I in this series. There is nothing to be done at this point except to be aware that changes will need to be made to most websites once the new tools have been released by WordPress. Once the new tools have been released, I’ll be available to get these setup and running on your site. If your website is informational (does not accept comments, no online store, no user login, no forum, etc…) then you may only need to implement items 1-3 above—WordPress is working on making this a simple as possible. The WordPress development team is actively working on the new tools to address GDPR Compliance and privacy in general. What is the GDPR – General Data Protection Regulation? Consent. Everyone whose data you collect must consent to you doing so. This doesn’t just apply to data gathered via forms but also to data picked up in the background such as IP addresses, if it’s used to identify an individual. Right to access. Individuals will have the right to access to their data and to information on how it’s being processed and used. Right to be forgotten. An individual will have the right to have their data erased, and for it to no longer be disseminated. Breach notification. Inform users if there is a breach. If you don’t allow public registrations, you might not think that you collect data from your visitors, but you probably do. Some of that data may come from EU citizens, even if they’re not part of your target market. Basically, it affects you if you collect any type of data, even unintentionally. The WordPress development team is actively working to address GDPR compliance for WordPress websites. They are working on centralizing tools in WordPress itself to help website owners understand and meet compliance standards. 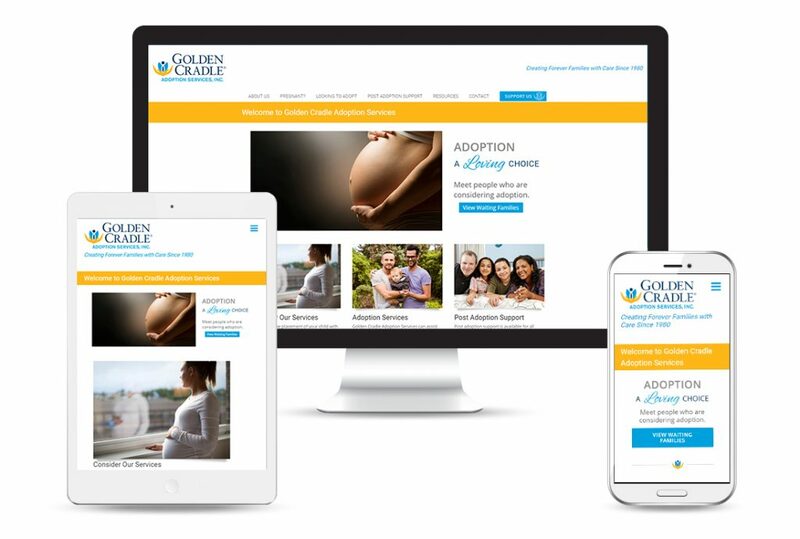 The new Golden Cradle Adoption Services website was launched the beginning of August. Golden Cradle is a worldwide adoption agency with a tradition of providing caring, personalized service to children, birth and adoptive families. They facilitate the adoption process to best meet your individual needs – whether you are a birth parent(s) considering an adoption plan or potential parents seeking a domestic or international adoption. Golden Cradle Adoption came to me during a time of transition within the organization. They needed a new website that would reflect the new direction of the agency. One of the exciting features that they asked for was a way to showcase their waiting families. Both the waiting families and birth families are finding this feature very helpful and it has helped find two matches so far!